In the Pines, photo by Michael Sharp, courtesy Finch & Fork. 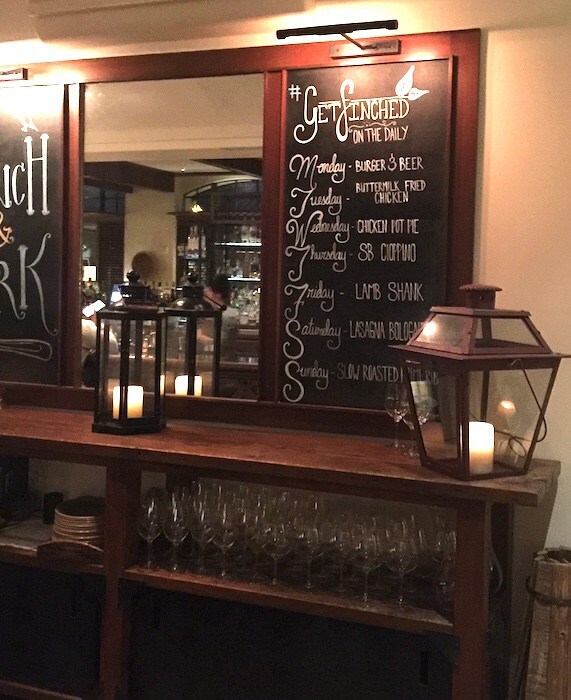 We got the chance to taste Finch & Fork’s seasonal cocktail menu and the late fall/early winter dinner menu, both of which are delicious! Lead Bartender George Piperis‘s new cocktails embrace the season with sensational sippers like the Daughter of Man with copper & kings brandy, honey crisp apple, black currant, honey and eucalyptus bitters, and the Captain Jack Sparrow with jack daniels rye, chairman’s forgotten cask rum, roasted banana and blackstrap and tobacco bitters. 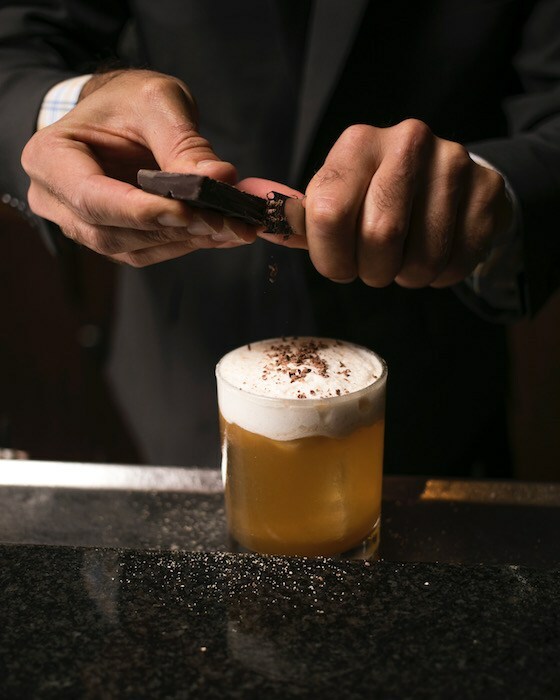 Christmas is definitely in the air with the In the Pines cocktail, made with death’s door gin, cardamaro, cocchi torino and pine pollen, and you can’t help but smile when you taste the frothy and tasty You Got Chocolate in My Peanut Butter, made with peanut butter–washed toki japanese whisky, tempus fugit créme de cacao and peanut butter foam. 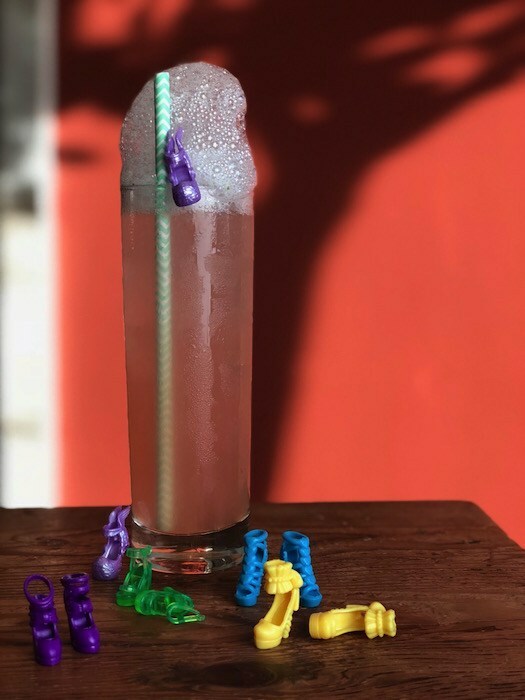 The little girl in me loved Barbie’s Bath Bomb, garnished with Barbie-sized shoes and made with Hangar One vodka, rhubarb, grapefruit, and a pouf of tarragon air. So fun! Finch & Fork’s Barbie Bath Bomb, courtesy photo. 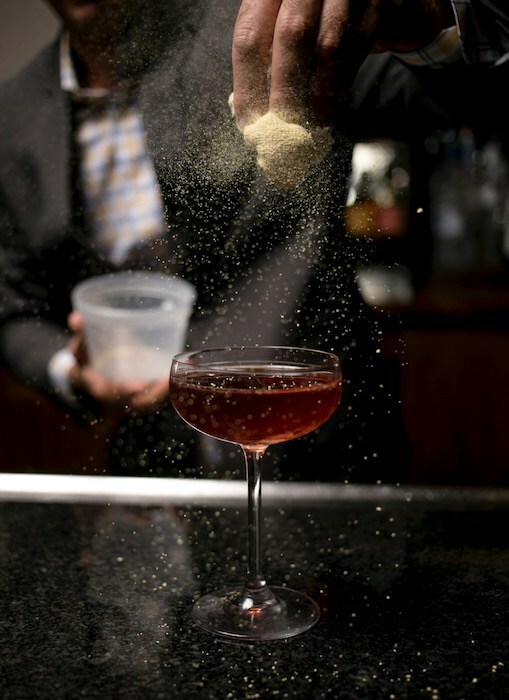 All those great cocktails helped up work up an appetite, and Executive Chef Peter Cham‘s tasty selections fit the bill to a tee. 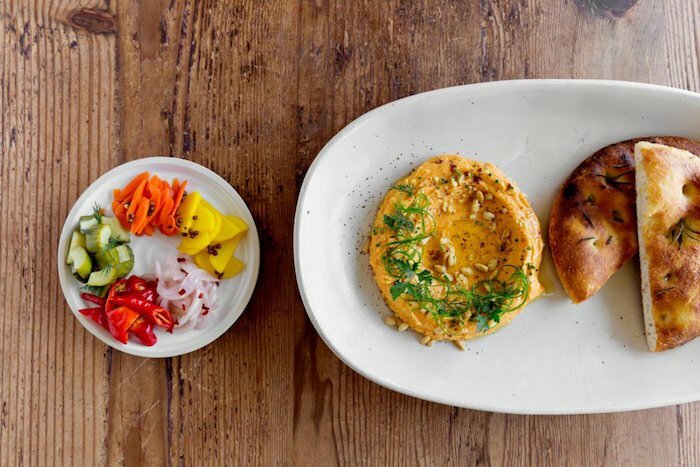 Among our favorites were the Sweet Potato Baba Ganoush, a surprising mashup of sweet and savory served with incredible housemade bread and pickled veggies. 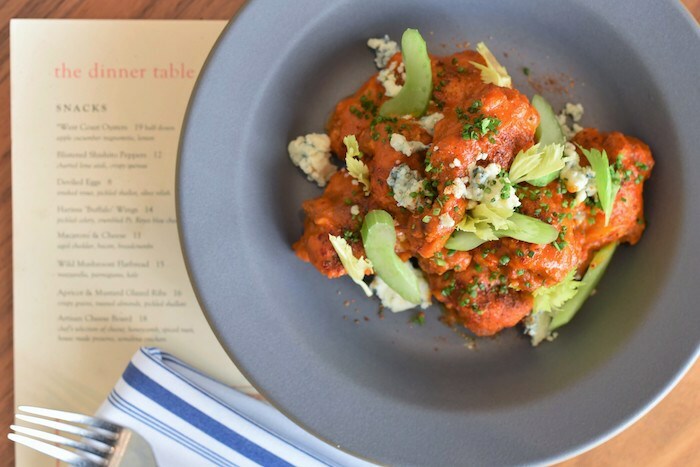 The Harissa Buffalo Wings are another favorite starter, along with hearty Mushroom Soup made with puffed​ rice, black truffle powder and chives (so aromatic and lovely!). The Burrata & Roasted Squash with pumpkin seed pesto, pomegranate, vadovan honey and rye croutons is a mouthwatering, original variation on one of our favorite cheese dishes. 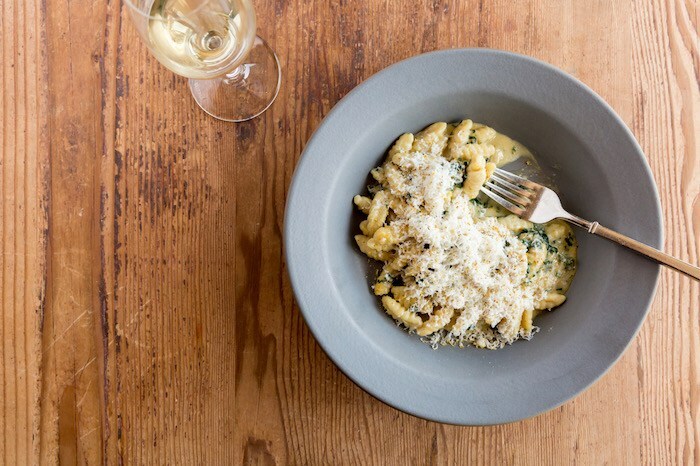 As for mains, the Fresh Ricotta Cavatelli with pork cheek ragout, poblano sofrito and aged manchego is fabulous. You also can’t go wrong with the Sea Scallops. This season’s version sits on a brown butter cauliflower puree, with romanesco, pickled kumquat and crispy capers. 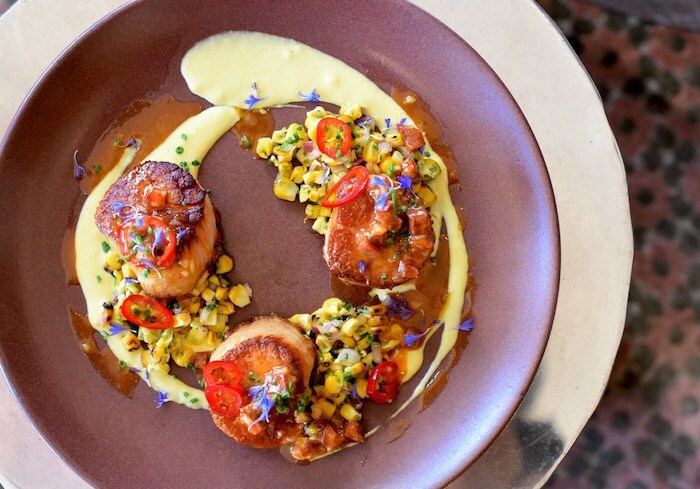 And even better yet, a portion of the proceeds from the scallops is donated to No Kid Hungry, a movement of teachers, chefs, community leaders, parents, lawmakers and CEOs with a shared belief: no kid in America should go hungry. Finch & Fork Sweet Potato Babaganoush, courtesy photo. 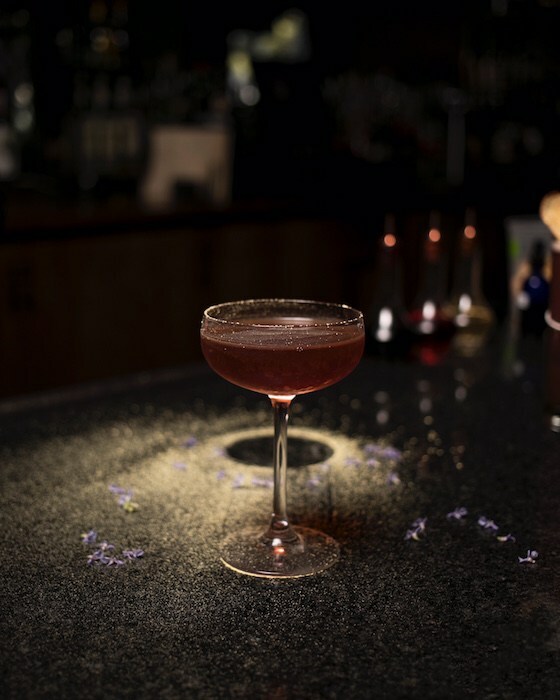 Speaking of hunger, Finch & Fork is offering yet another way to make your taste buds sing, when Chef Cham offers a special CHAMily Holiday Dinner. 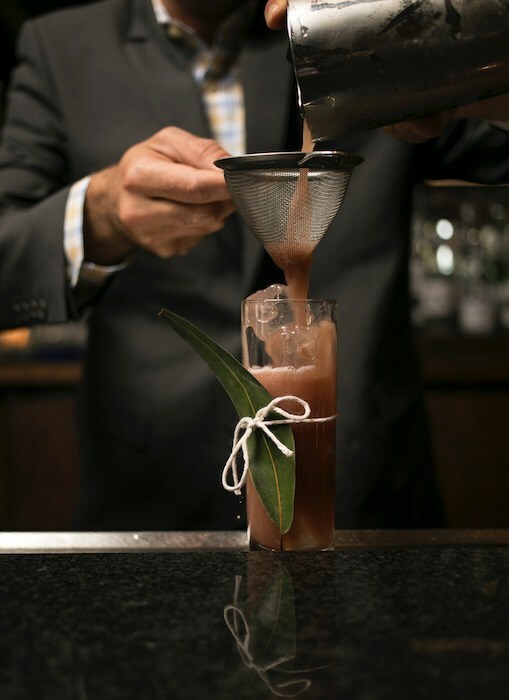 Gather around the table for an evening that takes you back to his Cambodian roots. The multi-course, family-style dinner features traditional Cambodian cuisine, like Prahok Ktiss and Noum Prajok, served alongside truly great company. The CHAMily Dinner is Saturday, December 8 at 7 p.m. Reservations can be made for $55 per person, which includes a welcome drink from lead bartender George Piperis. Optional wine and beer pairings are available. Call 805/879-9100 to make your reservation. Seating is limited. 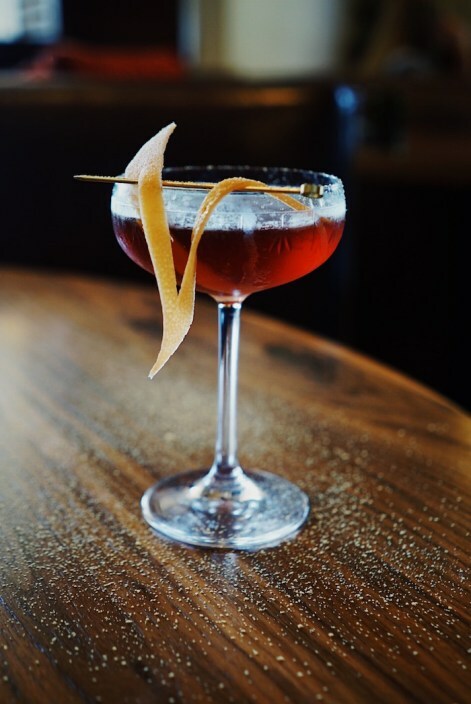 Finch & Fork is located at 31 W. Carrillo St. in the Kimpton Canary. Daughter of Man, photo courtesy Finch & Fork. Harissa Wings, photo courtesy Finch & Fork. Chocolate in my Peanut Butter, photo courtesy Finch & Fork. Finch & Fork Scallops, courtesy photo. Finch in the Pines, photo by Kevin Claiborne, courtesy Finch & Fork. 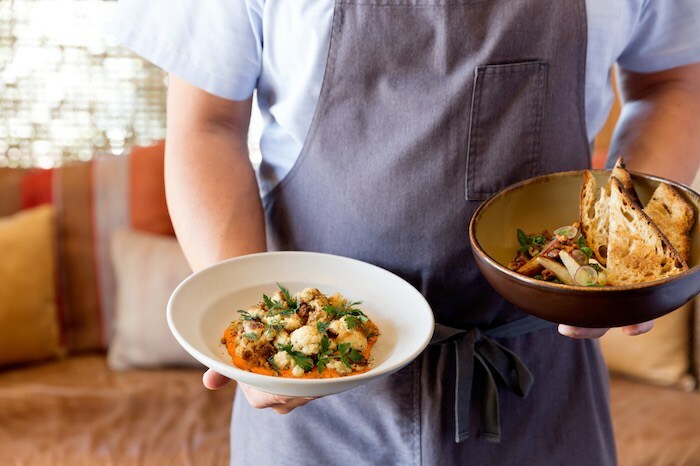 Finch & Fork’s Burrata and Cauliflower, courtesy photo. Finch & Fork’s Black Pepper Cavatelli, courtesy photo. Finch & Fork’s Daily Special Board, photo by Leslie Dinaberg. Originally published in Santa Barbara Seasons on November 30, 2018.